Lymphatic metastases are a key determinate of prognosis with esophageal cancer. 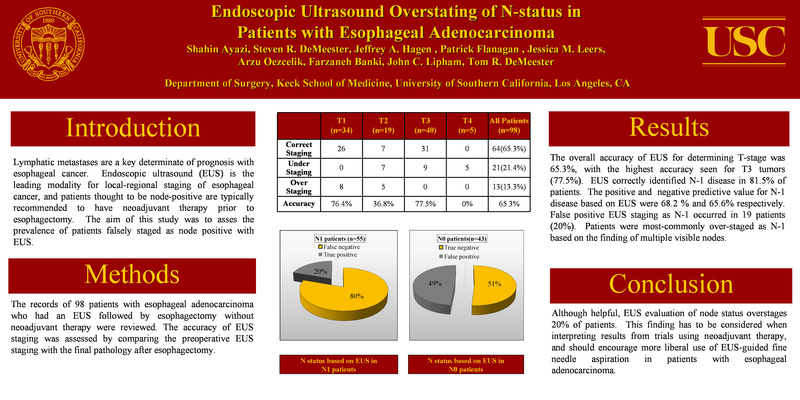 Endoscopic ultrasound (EUS) is the leading modality for local-regional staging of esophageal cancer, and patients thought to be node-positive are typically recommended to have neoadjuvant therapy prior to esophagectomy. The aim of this study was to asses the prevalence and characteristics of patients falsely staged as node positive with EUS. The records of 98 patients with esophageal adenocarcinoma who had an EUS followed by esophagectomy without neoadjuvant therapy were reviewed. The accuracy of EUS staging was assessed by comparing the preoperative EUS staging with the final pathology after esophagectomy. The overall accuracy of EUS for determining T-stage was 65.3%, with the highest accuracy seen for T3 tumors (77.5%). EUS correctly identified N-1 disease in 81.5% of patients. The positive and negative predictive value for N-1 disease based on EUS was 68.8% and 67.7% respectively. False positive EUS staging as N-1 occurred in 19 patients (20%). Patients were most-commonly over-staged as N-1 based on the finding of multiple visible nodes. Although helpful, EUS evaluation of node status overstages 20% of patients. This finding has to be considered when interpreting results from trials using neoadjuvant therapy, and should encourage more liberal use of EUS-guided fine needle aspiration in patients with esophageal adenocarcinoma.